Does the U.S. Have a Revenue Problem or Spending Problem? HomeBusinessDoes the U.S. Have a Revenue Problem or Spending Problem? There is a debate about the causes of the record deficits in the United States. Republicans argue that we have a “spending problem”, by which they mean spending is increasing too fast, while the left argues that we mainly have a “revenue problem”, by which they mean taxes are too low. The outcome of this debate will determine whether the most reasonable solution to the structural deficit will be tax increases or slowing the growth of spending. President Obama and liberals such as Paul Krugman like to give the public the impression that the deficit is entirely or to a large extent caused by Bush tax cuts for the wealthy (which is false, since Obama’s proposed tax increase on the rich would only collect 0.3% of GDP). If that were the case, the most fair solution to the deficit would be – as the President put it – to raise “a little bit more” revenue from the rich. It is easier to motivate tax hikes if you convince the public that the deficit was caused by tax cuts, rather than by an expansion in spending. When Republicans such as Paul Ryan say that the deficit is caused by a spending problem, they mean that once the recession is over, a federal tax revenue target of 19% of GDP (the historical average for the U.S ) is sufficient to cover for historical levels of spending. Throughout, keep in mind that we are talking about Federal revenue and expenditure, the U.S public sector spends about 40% of national income if states and municipalities are included. Slate columnist David Weigel attacks the Paul Ryan argument. His evidence is that revenue in 1981 was higher than later years of the Reagan presidency, which according to him proves that the Reagan tax cuts reduced revenue. Weigel is wrong. Revenue is highly volatile, because a lot of it depends on corporate profits, capital gains and other metrics which are influenced by the business cycle. Weigel is simply cherry-picking the year, 1981 was one of the highest years in post-war history. Similarly liberals like to pick the peak of the IT-boom at 2000 as the norm, where 20.6% of GDP was collected as revenue, even though it was the highest year in post-war history, and the second highest in American history overall (the highest being 1944, when Federal revenue was 20.9% of GDP). In order to give a better picture, I have plotted the average revenue, deficit and spending as a share of GDP for all presidential terms in the post-war period. First, this exercise shows us that Weigel is mistaken. Tax revenue during both Reagan terms was virtually identical with tax revenue during the Carter years, even though Reagan cut tax rates dramatically. Second, Revenues during the second Clinton term, the highest of the post-war periods, was 19.9%, only a little higher than the 19% level Paul Ryan has suggested (which liberals consider far too little). 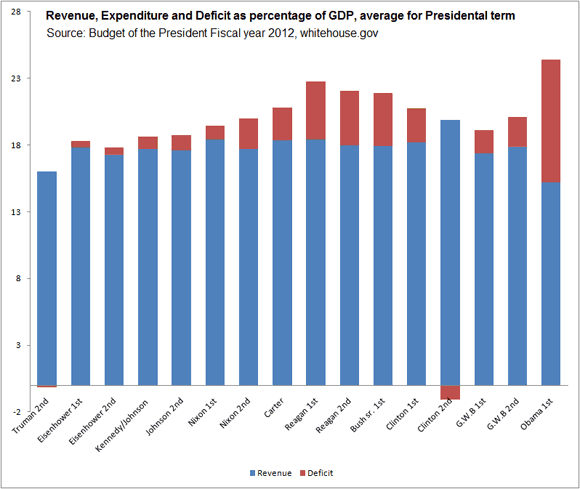 Lastly, President Obama has increased spending to levels never witnessed in American post-war history. Let’s move to President Obama’s budget, as calculated by the esteemed Congressional Budget Office. The President likes to give the impression that the deficit debate is about repealing the tax increases for the wealthy. But let us imagine what would happen if revenue during the coming years would be what is was during President Clinton’s second term, long before the Bush tax cuts. During those years revenue was 19.9% of GDP. The overwhelming majority of Presidents Obama’s budgeted deficit would remain even if he collected Clinton-era record revenue. By the end of his term, when the recession is projected to be long over, 80% of the deficit caused by President Obama spending plan would remain even when assuming Clinton-era record revenue. This is not strange, since during the second Clinton term, federal spending as a share of GDP was 18.8%. President Obama has already increased this to 23.6% in 2010, where it will remain long after the recession is over. With Obama’s budget, according to the CBO spending will be 23.4% at the end of his term. 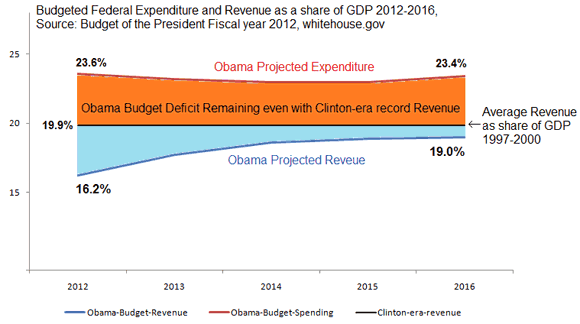 Clinton-era record tax revenue would be nowhere near enough to fund Obama-era record spending. I want to illustrate a final point. Let’s ignore the Obama years, and focus on the long run deficit. The figures for spending are from the Long Term Budget Outlook, again calculated by the Congressional Budget Office. These figures take into account the projected increase of Medicare, Medicaid and Social Security spending. Keep in mind that this is primary spending, which means that interests on the debt is ignored! Let’s also be more generous. Instead of assuming revenue for the presidential term with the highest revenue, let’s assume revenue for the record year. As pointed out previously this was the boom year 2000, where revenue was 20.6% thanks to record breaking capital gains taxes and corporate profits. This picture illustrates what would happen if Federal revenue as a share of GDP increased to the record high of the post-war period and remained there forever, and we continued at the currently projected levels of Federal expenditure. 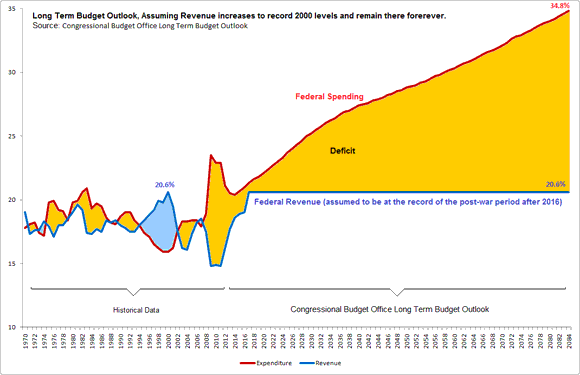 Because of ever expanding government, the deficit would still explode when assuming record levels of revenue, with the debt growing to several hundred percent of GDP. John Stewart was therefore misleading his economically unsophisticated viewers when he showed them a graph where the deficit appears to vanish if only the Bush-tax cuts were repealed. The only reasonable conclusion that the United States primarily has a spending problem, not a revenue problem. It is the expansion of the government – some already carried out by Obama, some projected to occur – that is causing the long term structural deficit to grow beyond control, not a reduction of revenue caused by lowering the taxes on the rich. If liberals want to argue that government spending is too low, and that we should increase it for reasons of social policy and raise taxes to pay for it, they should feel free to do so. But please do not claim that the long term deficit is primarily caused by taxes being too low relative to historical levels, because that is simply not true.